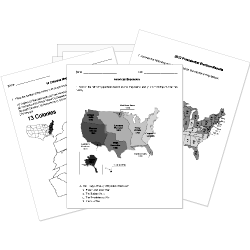 You can create printable tests and worksheets from these Grade 7 Civil Rights questions! Select one or more questions using the checkboxes above each question. Then click the add selected questions to a test button before moving to another page. The Voting Rights Act of 1965 enforced the Fifteenth Amendment and outlaws discriminatory voting practices. Which of the following is not true about "Jim Crow" Laws? When was Emmett Till born? Where was Malcolm X born? Having to follow the laws and the government having to enforce the laws fairly without discrimination is called . Who believed that equality could be achieved through vocational education? started a new school to help African American girls who had been in jail. What do the abbreviations 'U.N.I.A.' stand for?